‘Twas Dad who made me straight. Author Unknown — But a Wise Man Indeed! that little lad of long ago was hopeful he would be. was jumping on and off a horse within a sawdust ring. to be the spangled hero in the roaring lions’ den. contrived to change the life-work of this circus-dreaming lad. he sees an acrobat’s career would not have done for him. a little boy of fifty-one walks wide-eyed round about. It’s been a long time since we cousins have posted anything on this blog, so I’m wondering how many Followers we still have. But for those of you who are, and for readers who have just clicked on, intrigued by the title, I hope you enjoy this personal memoir, circa 1990. One bright summer day my teenage daughter and I were doing some cleaning in the kitchen of our home in Fullarton, Ontario. My husband, Bob, was outside doing some yard work. Our house was an old one, built in the 1890s, I believe, and the kitchen was long and narrow with one short row of cupboards. At one end of the kitchen cupboards there was a black iron pipe running from the basement to the roof. This pipe acted as a plumbing vent of sorts and someone had nicely boxed it in to look like part of the cupboard setup. Small as it was, maybe 16 inches square, the cupboard was floor to ceiling so we used it as a closet for brooms and mops. I was wiping it out that day in the course of washing down the kitchen walls. My daughter was in the kitchen with me; I believe she was washing dishes at that moment. The pipe running upwards through it was mostly uniform in diameter, but there was one spot about shoulder height where a joint was covered with a ring, giving the pipe about an inch of extra thickness all around. All at once I took note of something dark and fuzzy scrunched behind the pipe. It was sitting just above this joint on top of this ring almost completely hidden by the pipe. Whatever was it and how long had it been there? I took a closer look and froze. The “thing” was mottled brown, about the size and color of a large dead mouse or small rat. Not being very brave myself, I hesitated to pull it out and verify my suspicions. I called my daughter to come and see, hoping she’d remove the thing. (She has always been much braver than I when it comes to tackling small beasties.) She took a look at it, then wrinkled her nose. No way was she going to try pulling it out, either. By now we were fairly sure it was some sort of intruder that had crawled into the cupboard somehow and died back there. And we were sure it had to come out. But we were both certain that neither of us was going to have a go at poking or pulling it out. Even if it didn’t smell, it still might turn into an icky mess in our fingers. He came in to see what had us all so petrified, eyed the dark fuzz for a minute, then reached back and yanked the dark lump out. And smiled. The “creature” was actually two things: two scouring brushes that attached to one of those old floor polishers. Probably not originally brown, but grubby and rusted with age. Our hero held it up for us to inspect. Quite harmless. Isn’t it amazing what your imagination can conjure up when you see a bit of brown fuzz lurking n some dark corner? This account originally posted on my main blog Dec 20, 2015. Traditional skills, such as knitting, connect us to past generations. I never knew my great grandmother Mary Vance, but she was an expert knitter and I feel that when I knit, I share in her legacy, although we have no direct knitting connection. I recently took knitting lessons, and as I click my needles, I am reminded of her contribution to family and community. Grandma broke an ankle as a child and she walked with two canes or a crutch. 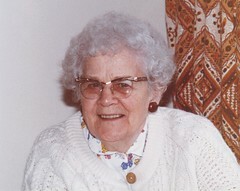 Many activities were difficult, but knitting became her passion and she knit for six grandchildren and the family adults. Prairie winters were cold and everyone bundled in woolens to keep warm. Grandma made toques, mittens, scarves, socks, sweaters and even undershirts. She used wooden needles, probably from prairie hardwood. Sweaters were knit flat and joined with seams but toques and socks were knit in the round with four pointed needles. Her yarn was probably obtained from a local farmer who raised sheep and after carding and weaving, she dyed it using natural plant dyes. I recently saw the expression: Knit Fast, Stay Warm and I thought of Grandma sitting for hours with her knitting needles clicking. 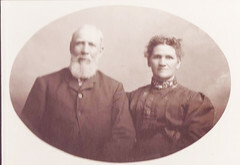 In addition to knitting for her family she contributed to church bazaars and to neighbors. Today there is renewed interest in knitting and I enjoy the variety of yarns in the local wool shop with an endless selection of colors, textures and blends. There are circular needles for round knitting, and nickel-plated brass and bamboo for speed. A grandchild would have wound balls of yarn from skeins on a chair back for Grandma, but today most yarn is sold in balls and there are ball winders if we need them. I knit toques, mostly from thrift-store yarn, and I marvel at the combination of patterns and colors that result from partial balls of yarn. Grandma Vance also made toques and mitts from leftover yarn and I feel the connection to the past as I create my designs. As knitted garments aged, Grandma darned them to keep them in good repair. Older kids passed their usable garments onto the younger ones. Finally, when the garments were unusable, they were pieced together for quilt batting. Quilt tops, made from sewing scraps made a decorative cover for the recycled batting. Grandma’s creativity with her knitting needles was born of necessity, and today I am glad to carry on her tradition. In learning to knit, I feel that I am connected to her, and to the prairie women of her generation whose thrift and resourcefulness settled the Canadian Prairies. Hobo jungles were places for the homeless to gather in the 1930s and they sprang up around most major railway cities. There was little employment and men rode on freight cars without paying fares, going from city to city, looking for work and congregating in camps or jungles where they cooked and shared food. Some of the food was purchased or donated and some was stolen. 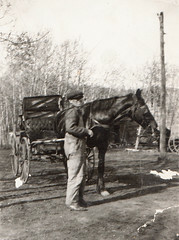 Chilliwack BC, where I live, had a large hobo jungle throughout the Depression years. My Dad, Charlie Vance, recalled being in this jungle on two occasions when he came to Chilliwack to pick cherries, however, the pay was so low picking fruit that he did not stay. Times change and there are still homeless people in our community, but today we have soup kitchens, food banks and missions where the homeless can stay, however, it is not uncommon to be approached on the streets by panhandlers, people wanting money. We recently had Chinese food at one of the local restaurants, and after our meal the waitress boxed up the leftovers which I took. Before we drove away a woman approached and asked if she could have our leftover food. I was speechless and she told her story that she was homeless and needed something to eat. I never give money to panhandlers, but I gave her the leftover Chinese food. The woman took the package and walked toward a group of three or four people sitting on the sidewalk in front of a nearby business where she shared the food with them. We later laughed about this episode with the people we had dined with and someone suggested that we could go out more often for Chinese food if we followed this group’s example. Instead of ordering a flask of wine, we’d have our bottle in a paper bag and pass it around. I thought of Dad and wondered what he’d think of this incident. I do not know whether the people really were homeless or hungry, or just innovative, but our leftovers provided an outdoor picnic for them of good dining of Chinese food. The hoe in the backyard is mighty good backing for the flag on the front porch.1. 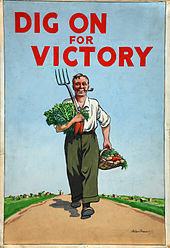 Victory Gardens, War Gardens, or Food Gardens for Defence were popular in WW1 and WW2 as a way to combat the food shortages of the times and to free food resources for military operations. It was patriotic to grow vegetables and to preserve food for winter use. Home gardens and community gardens in public parks were a source of civic pride as gardeners fed their families and helped the war effort by being self-sufficient. 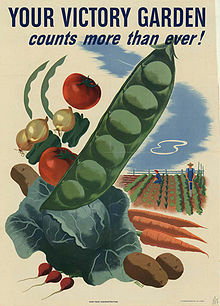 Home gardening, food preservation, and economic cooking was the patriotic duty of the home front. 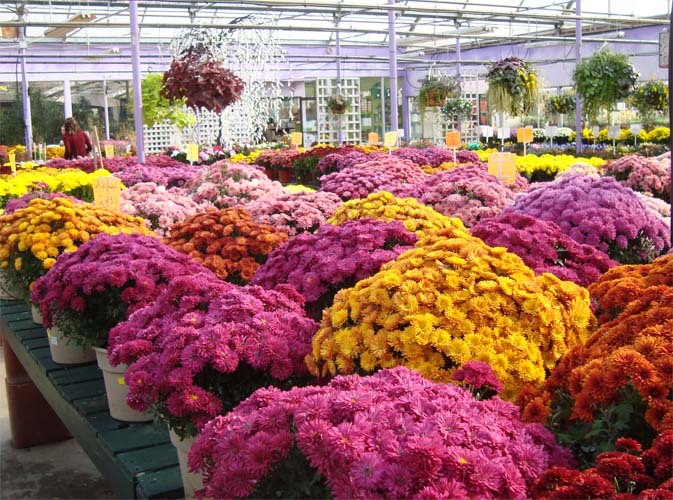 Today there is a resurgence in gardening and in eating wholesome fresh foods. Community spaces are once again being converted to garden plots. In Chilliwack BC, where I live, a downtown lot was converted to raised-bed gardens with each plot assigned to a needy family who agree to donate half to a local mission for the hungry. Vancouver BC has its own Victory Gardens today as people utilize public and private space around them for food production. People are encouraged to be food heros and to grow their own. Community urban gardens increase food sustainability and can be found on balconies and on boulevards. In some areas lawn size is diminished to create space for planters. Restaurants are experimenting with growing salad crops to serve the freshest food to their patrons. Vegetable seeds have improved over the years to provide resistance to plant diseases, to mature in a shorter growing season, to yield in containers, and to enhance flavors. Commercial produce travels a great distance to market, which requires high energy and increased costs. In Canada with most of our winter produce coming from the US, fluctuation in currency can cause produce prices to spiral. 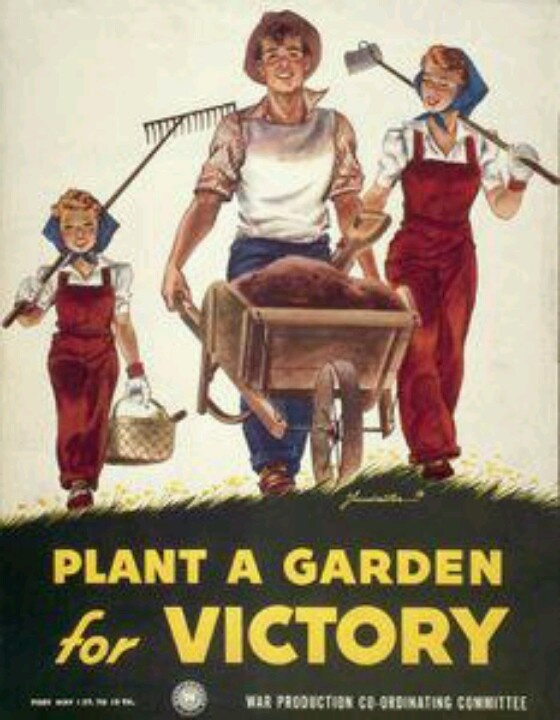 Victory Gardens were successful in wartime years and have much to offer us today. They are an opportunity to cut expensive food costs, grow healthier foods, and offer more variety in our food choices. 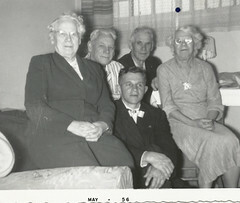 When Hugh McKervill was in training to become a minister in the United Church of Canada, he was sent in the summer of 1955 as a student minister to the people of the Smoky Burn-Battle Heights-Papikwan area (at the edge of the farming land, north of Carrot River) in northern Saskatchewan. When he arrived, he learned that his flock had scrounged together enough money to buy their student minister a sturdy old Model A. This car served him well that summer, chugging over roads that were almost impassible after heavy rains. However, there were times when even the Model A surrendered to the clog-up of its innards. Min. McKervill writes about one evening in particular when he was endeavoring to get from Point B, where he’d been visiting, to Point A where he boarded. This was after a heavy rain and the road to Point B – which dipped down into the Carrot River Valley and then up the other side – had been passable during the day. However, sometime later a tractor had lumbered down this road after him, slithered down the one hill and then up the other, throwing up huge clumps of mud and carving deep grooves as it fought for traction in the gumbo clay. Returning home, the student minister started down the slope into the river valley and found he couldn’t keep the wheels of his Model A from sliding into those ruts. To make matters worse, the car wheels churned up more mud so the engine compartment filled with the goo. Then its wheels slid into the deep tractor ruts and he was not only clogged up, but hung up as well. This area was sparsely settled and it was later in the evening; the chances of another vehicle coming along were slim. He saw no choice but get out and walk home. He wore rubber boots in those days and they clump, clumped down the hillside, across the narrow bridge, and up the other side. With dismay he realized that daylight was almost gone. He reassured himself constantly that there was absolutely nothing to fear in this wilderness. Granted, he could meet a charging moose…or an angry mother bear…or maybe some timber wolves. There was even the odd chance of a prowling cougar, strayed from its usual range in the wooded hills to the southeast. But other than that, he comforted himself, there was nothing in the descending darkness that would harm him. As young McKervill trudged on, he entered a forested area where trees crept right up to the road. With every step he reassured himself that there was nothing to fear. At one point he decided that it would be prudent to hurry so as not to be too late arriving home. He dashed off like a gazelle chased by a leopard, though not nearly as graceful with his rubber boots going “Splat! Splat! Splat!” and sliding on the wet road. At last he reached an area where the trees didn’t close in so menacingly. When he could run no more, he slowed down, stopping to catch his breath now and then. During one of these times he heard a twig snap not far from him. Heart pounding, he listened for telltale sounds. The silence shrieked. So he hurried on. A few minutes later he heard another sound, then a footstep. He stopped and the noise stopped. He started walking and he heard a rustling sound in the brush beside the road. This time he had to admit it: some creature was following him! He envisioned the newspaper headlines reporting his demise. Something like :“Minister Mauled to Death in Northern Woods” or “Cougar Crushes Cleric.” He stopped again – and the creature stopped. “Getting ready to pounce,” his mind announced. In a little more open space he froze when he caught a glimpse of a huge black form. He dug out his pocket knife, realizing how useless the tiny blade would be against such a massive enemy. He walked on a little farther and the creature followed. His heart pounded in his chest. When a gleam of moonlight outlined the beast’s huge head, its eyes glinting in the light, his heart almost stopped. Suddenly from this black shadow came a bone-chilling wail. His heart rate settled down to something near normal again and he plodded on. The cow or steer walked along beside him most of the way to his lodging, then turned aside to join other animals in a pasture. Half a mile further down the road the northern sky burst into a glory of dancing northern lights. He writes that at that moment he felt like dancing, too. In the 1930s I lived at Thicket Portage, a small community on the Hudson Bay Railway in Northern Manitoba. At the center of town, facing the railway tracks, was a new general store, and beside this store was a tarpaper shack that had been there for a number of years. It was winter and I was a commercial fisherman, working with eight other fellows, one of whom lived in the tarpaper shack. Our community was small, and there was no Protestant church, but occasionally a travelling minister would visit. On this occasion a young student minister came to town to preach the gospel. We had no community hall or public building, so he approached the storekeeper and asked if he could hold a church service in the store. The storekeeper agreed and benches and chairs were brought in to accommodate the small congregation. None of us had attended church for some time, but in those days, all Protestants, of whatever denomination, were expected to attend church when it was held. We were fishermen who were used to life in the bush, and a church service was foreign to us. The service commenced and we restlessly listened to the sermon, but we did not know the words to the hymns and none of us could sing. The preacher did his best to encourage us, but he could not carry a tune, so the hymn singing was a failure as most of us remained silent. Finally the service ended and we shook hands with the minister and departed. We were embarrassed about our lack of singing and we were glad to leave. The fellow who lived next door in the tarpaper shack invited us to his place and we went inside and sat down. He got out a bottle of whiskey and we each took a drink while we discussed the service. We thought about our lack of participation and one of the fellows remembered that he had sung when he was younger. Somebody else remembered that he could sing a little and another fellow remembered a few words to a hymn. After another drink one fellow started to sing while the rest of us hummed along until we remembered the words, and then we joined the singing. We had another round of whiskey and then we all remembered the hymns and raised our voices. We continued to drink and the singing became louder. We were silent. We had never heard a preacher swear and we were embarrassed to have left church for a bottle of whiskey. It seemed like blasphemy to be singing hymns and drinking after a church service. The preacher responded: “Don’t mind if I do.” and reached for the bottle. No one had expected the preacher to accept a drink of whiskey and we were surprised by his response. We found ourselves liking this man and we relaxed and told him about our lives. He understood the loneliness that we experienced, and before long, he led us in the old familiar hymns which brought back memories of loved ones far away. When we finally quit singing we were glad that this preacher had come to our community. Instead of criticizing us, he shared his faith and gave us the gift of fellowship and understanding. Our lives, which had been bleak, were brighter for his presence. We wish all our readers a Joyful Easter.